You save $30.25 Over 61% saving! If you find flying helicopter is much harder than you think, then try our RC flight simulator! You don't have to waste money on over-rated software that cost hundreds of dollars when you can just pay $24.95 to get one of the best-rated flight simulator program in the world. You will receive a complete kit with both hardware and software included. All that is required for you to do is installed the software and connect the USB cable from the supplied transmitter to your computer and off you go! 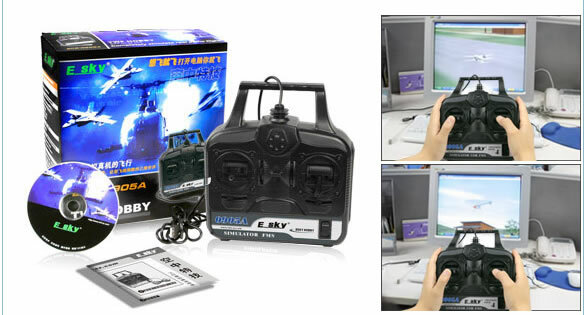 The Esky Flight Simulator is a MUST HAVE ACCESSORY for anyone who has no plan to waste time and money to learn how to fly one of the most exciting toy in the world! Radio controlled helicopters are one of the hardest thing to master in the hobby-world and for anyone who is new to this hobby, expect to bust out your wallet to buy replacement parts because YOU WILL CRASH. However, with the RC Flight Simulator, it will definitely minimize your damage to the lowest and you will not regret because for all we know, this wise choice will cost you LESS than 20 bucks and the training is comparable to the same flight simulator that cost $300 from GreatPlanes and Horizon! With that big difference of price, you can just buy like 2-3 hot helicopters here!!! This is a revolutionary new Model Flight Simulator that allows the user to fly with the same type of transmitter used for regular flight. There are only a few Transmitter and Simulator combos on the Internet and none are equivilent to the ESKY FMS Simulator Package in value. "5" "Dennis" "November 15, 2012" "The installed very easy but sorry to say I was not able to run the program correctly as I'm using windows vista os. The main problem was my video display it would just jump around very fast and was unable to see anything. I do have a xp machine but again my problem is that all the computer are located in the basement of the house I can remote log into the xp computer only problem that the xp computer would not see the usb connection. So i just ended up using the esky transmitter with another program on my main vista computer." "5" "Forrest Vanlandingham" "October 31, 2012" "Great price for a simulator that will actually help you learn to fly RC. Had problems with it on a computer with Windows 7 but followed the advice found on YouTube to download .dll fix and it works fine now. I'm using this as a refresher from flying a nitro model 30 plus years ago and am looking forward to once again taking to the skies. Thank goodness prices have become so much more reasonable for a great hobby." "5" "Don Casteel" "September 30, 2012" "First FMS is an open source project, what you're paying for is the psudo transmitter and the CD (FMS can be downloaded free) That being said, I downloaded and installed FMS on a Win7-64 bit PC with Nvidia Quadro FX 1600M video card. The display doesn't work with textures turned on, and it's crashed my computer twice. The simulation works without the textures, but there is no grass, landing strip etc... As for the simulation... my transmitter has docile curves, but the simulator does not seem to recognize this. It makes no sense, because toe training port should be sending out the adjusted output. The flight dynamics, do not represent the actual flight experience, but since they are more sensitive than real life that's not a bad thing. Now I realize the supplied controller and installation CD may fix all of this, but I just want you to know what you are buying." "5" "Butch O'Dell" "September 28, 2012" "I am so glad I purchased this simulator. i would have destroyed my first plane. I am learning to fly the simulator before I purchase my fist PRTF plane. GREAT simulator. The hand held controller is so authentic and handles well." "5" "Samuel Lainez" "September 5, 2012" "I am satisfied with the product - it was easy to install and start using right away. For a beginner and for the price it is a good product" "5" "CORL" "July 1, 2012" "WILL e-sky SIM WORK ON ZISTA THANK YOU" "4" "Andreas, Edmonton Canada" "April 5, 2012" "Received product as advertised. Took 8 days to Canada, not bad. Excellent value. Software is not so great, but at this price, it can't be beat. I am using it with Clearview RC simulator now and it works like a charm. It's great to practice flying and get prepared for the maiden. :-) Haven't flown an RC aircraft for 25 years. Can't wait to get my T28 1400mm up in the air when the weather turns better." "5" "W Harbaugh" "April 3, 2012" "A good beginner simulator, good value for the sale price." "4" "Otis Bradley" "March 22, 2012" "The product is better than I expected for the price. The hardware works well, but the software could be better. I wanted to simulate my Super Cub, which has only rudder, elevator, and prop speed controls (no ailerons). It appears that you must execute turns with aileron type response. Still, its a good buy." "5" "jacques jr" "February 8, 2012" "There great for the price! Buy it!" "5" "Jerry" "February 4, 2012" "good for the price. Fun and helpful. Controller can be used on other sims if you upgrade." "4" "Thomas" "January 29, 2012" "I've been using this produkt for couple weeks. For money you pay it is a great hardware ! Doesn't feel like a toy from Wal-Mart :-) But I have problems with FMS software. It is quite old (2004 as far I know) and it doesn't run properly on nVidia geForce cards. There are two ways to run FMS - roll back the video card driver to older version, or run the program in virtual machine (VirtualBox or VM) and lose some resolution. cheers Thomas" "5" "R. Gallardo" "January 25, 2012" "It has helped me very much as I am new to RC equipment." "5" "Mike" "January 16, 2012" "Works great and great value" "5" "Glenn" "January 3, 2012" "Worked right out of the box. Good delivery to Canada. Thx" "5" "Korby" "December 26, 2011" "Got this as part of Black Friday deal!! Works great with G4.5 :)" "5" "STKRUDDER" "December 14, 2011" "EXCELLENT PC. OF EQUIPMENT-AT A PRICE ANYONE CAN AFFORD. BUY ONE , YOU WILL LIKE IT." "5" "Rich" "December 13, 2011" "cant rate it it didnt come with a disc still waiting for it to arrive" "4" "Daniel Jones" "November 29, 2011" "The software works very well, but I found it a much more difficult task to master than I had imagined." "5" "Steven" "November 10, 2011" "I like this better than the 6 channel Tx that they sell... the quality is much better, I also open it up and flip the spring around to take away the ratchetting thing... a must for heli's... I use this with another sim... have used it in windows 7 with another sim too..." "5" "David Cline" "November 9, 2011" "Works GREAT! This realy helps you learn to fly, so, you don't destroy your plane when flying it! Very Happy with it!" "5" "Mike Manning" "November 4, 2011" "For the price this Simulator is great... We had it down loaded and working in no time. Very good product.." "5" "Harold" "November 3, 2011" "Love it, great product and excelent price but expensive shipping." "5" "jack W" "October 29, 2011" "has help me control my water landing aircraft" "5" "Ken" "October 29, 2011" "Great Price!! Great Product, Great Company to order from. Shipping was fast. Nothing else to say except: "Buy one, You will love it"!!!!" "5" "Airchime" "October 27, 2011" "I bought this for a friend whom I'm teaching to fly. And he justs loves it! One more month and he'll be ready for the real deal. Don't waste your money on those high end sims; sure, the graphics are better but who cares?! Your learning to fly!" "5" "Wes" "October 18, 2011" "Hey, for the price this flight simulator is a great starting point to help ease into R/C model flight. So far I believe it has saved me a lot of money, if you count the early crashes on screen rather than in the field. Thanks for providing a low cost alternative with support to back it up. I recommend all buyers watch the video which explains how to configure and operate the simulator. My thanks to Hobby Partz." "5" "dan" "October 11, 2011" "Easy to use even for me (not a computer geek)" "4" "Dave" "October 7, 2011" "I have just about no experience with flying RC aircraft, but I have no complaints about this system. So far, I'd say the key is a good model for the specific model you want to learn to fly. I found three for Hobby Zone Super Cub. Each flew different. The model I thought flew best has a problem steering on the ground. I also have not been able to get it to work properly on a Windows 64 bit machine. Works fine on my 32 bit machine. Of course the software is free to anyone. The controller is a bargain. I don't know how representative it is for all controllers, but is good for the Super Cub." "4" "TUN H AUNG" "August 9, 2011" "You cannot load this CD on Window 7 or later version. It is pretty good on Window XP. Not much of a help in Heli hover practice as it is too easy and too stable. But an excellent trainer for 3D Heli practices!" "5" "Jeff" "August 3, 2011" "I thought it would be great but i am not sure if my operating system will allow mw to use this program. Does anyone who have this know?" "5" "Andy Gilman" "July 18, 2011" "Great product and excelent price." "5" "Jack" "May 3, 2011" "This is a steal at that price. Works as good as the high dollar sim. Plenty of models and scenery around the net." "5" "Mark of Canada" "April 27, 2011" "Can't really say anything about the sim as I am using the controller only with another sim I downloaded from the net. (Couldn't wait for this one to arrive in the snail mail.) Controller is great though. A little stiff but you can change that if you want." "4" "Jesse" "April 16, 2011" "the controller works very good hav'ent noticed any lag between inputs and responses,like I have with other simulators. the only reason for a 4 star versus a 5 star is the software,I like it fine and it will serve its purposse, but it is freeware so the grafics are pretty lacking making the world a little difficult to gauge,witch isn,t a real problem with helicopters because you can keep them close and low,but planes are a little harder because they cant stop so there here and gone pretty quick .even still with a little practice and time spent on this sim im sure you could get the hang of a plane in this enviroment. all in all you cant beat this deal it will increase your confidence and abillity and cost less than your first wreck." "5" "Kent" "April 7, 2011" "just what i was looking for as a new r/c pilot....great price and equipment.....can see how this will make flying so much easier to learn.......CUDOS" "4" "Rueben" "March 31, 2011" "Not bad I just need to get on it more so I can get my flying skills up then I can buy for first RC Flier, the other cost way more and you get what you pay for; if you are on a budget like so many are these days Hey why spend more then what you have to just to learn how to fly a RC model" "5" "HARRY HOHNSON" "March 28, 2011" "I LOVE IT BUT///// HOW DO I GET THE CONT. TO BE THE SAME AS MY REG. CONT.ON THIS ONE THE THROT IS LEFT TO RTGHT AND THE AIRLONS ARE UP AND DOWN ON THE LT SIDE OF THE CONT. ALSO THE RUDDER AND ELEV. ARE BACKWARDS. I NEED HELP I STILL GIVE IT A 5 STAR PLEASE HELP BACKBURNERHARRY@YAHOO.COM" "4" "Rob" "March 23, 2011" "It is helping me gain the experience it turns out I needed desperately. I cannot imagine how many aircraft and/or parts I would have gone through trying to fly around the field just once. I can imagine spending a lot of money and after I went around once and landed, I'd walk away and toss the radio to the nearest person." "4" "shunle" "March 19, 2011" "It's very good for beginer." "5" "Tim" "March 10, 2011" "Bought 2 of these sets and niether one will load from the provided disk. After extensive searching on line to get repairs and missing files I was able to get something on the screen but only half the controller worked and it could not be calibrated to fly anything but inverted operations. I have contacted the seller to see about return and have not heard anything back from them in over a week." "5" "DRM" "February 24, 2011" "Is a good sim. You should have a link to the files needed to install on Windows 7. Woukld have saved a lot of time and searching. Worth the 20$." "5" "Bob" "February 23, 2011" "This product is great. Works as advertised. Has a lot of internet support. Price is right." "5" "Ron Fischer" "January 25, 2011" "The contoller works great! The price makes it even better. Thank you for the guys that spent their time to write the software and give it to us for free. 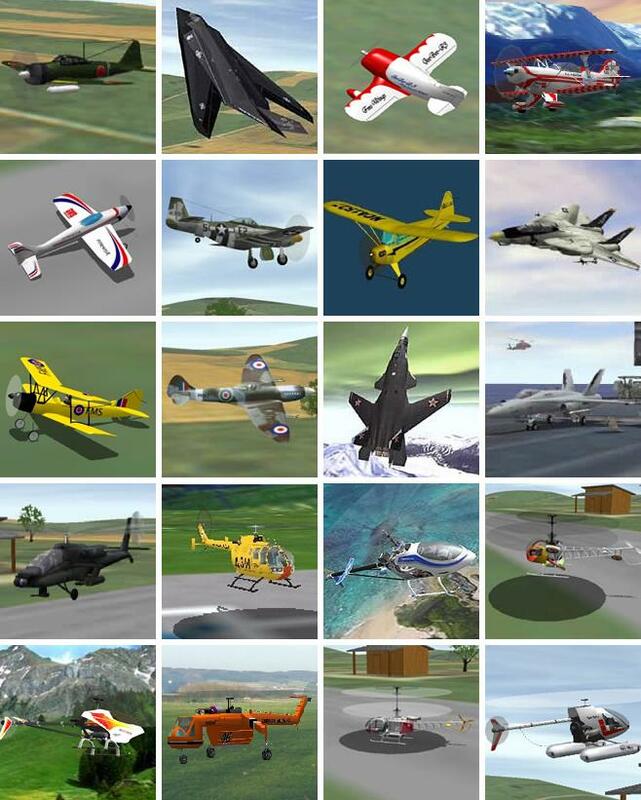 Flying Model Simulator or FMS is a freeware program written in 2000 by German programmers Roman and Michael Möller" "4" "Jeff" "October 26, 2010" "Well worth the inexpensive cost, but soon I was looking for a more sophisticated FMS, which I did and bought, nothing wrong with the esky 4, I just wanted more detail to view on the HD flat screen." "5" "William Pharis" "October 15, 2010" "This is the second unit I have purchased of this item. I find no fault with the software. After all, the software is "Freeware" and no real cost is involved, save the cost of the disc. However, the transmitter/joystick controller leaves everything to be desired. It is a totally useless piece of junk. Apparently, during assembly of the unit, they mixed up a few things and ended up with controls working -- Well, they ar5e mixed up as to what controls what and in what direction. No0, I am not nuts and do know the difference between left and right. I purchased this for my grandson, but will buy something else. No, I do not blame HobbyPartz, as they are great, and I will purchase from them in the future, I guess you get what you pay for. Bill Pharis Woodstock, GA" "5" "Casey Jones" "September 20, 2010" "This is a great product for the money, very helpful training tool, I recommend it to anyone thinking about flying rc airplanes." "5" "Michael" "September 14, 2010" "Excellent product, bought one for my nephew as well." "5" "philip g." "September 3, 2010" "does not work on windows vista need older windows 98 thats why its so cheap." "5" "Al_Winf" "August 5, 2010" "This product saved a lot of money and time for me. I'm able to learn the basics and see if I like RC flying or not. I have crashed the virtual airplanes hundreds of times without loosing a dime. Eventually I plan to buy a slow-flying low-end model. The "free" software is not of much use unless you have a way to simulate the control box. This system integrates pretty good software with a realistic controller. Spend the money! $20.00 plus shipping is nothing compared to what you loose if you crash even one new airplane when learning. It's a good deal!" "5" "Mark" "July 20, 2010" "The controller works great, the software is OK. I use this contoller with a different sim and love it." "4" "papabear" "July 19, 2010" "At first it was a bit hard to get set up properly, I crashed a lot, but no damage done. After I got a little experience with it, it worked great. I can't believe the low price!" "5" "Nirmal" "June 12, 2010" "Doeesnt work on Windows 7... so those of you out there with win 7, dont buy this. otherwise, its a really good deal" "4" "Frank" "May 29, 2010" "Great for the price... Not so good graphics but this isn't a game, it's a training tool for flying... would recommend to anyone wanting to get into RC Heli or Planes!" "3" "J" "December 28, 2009" "Easy enough to set up on XP, very difficult to set up on Windows 7. The readme file says this is freeware, so you are paying for the control box. Graphics are pretty basic. Control of the helicopter seems accurate." "5" "mike" "December 17, 2009" "thanks to the 20.00 i spent on this, i've probably saved myself 2-300.00 in parts learning to fly. DEFINATLY worth it, especially to newbs like me." "5" "Lou Aymard" "August 3, 2009" "I started in RC with this simulator and it is a terrific bargain. When I first I saw it I thought it must be junk. Boy was I wrong. I've spent hours flying 4-channel helis and planes on this and found the skills transferred beautifully to the real models (especially helis which are hard to fly). This is the real deal not junk electronics and so much less expensive than the $300 dollar models. Buy it today!" "4" "Paul W" "July 1, 2009" "This is a great sim . I learned to fly heli's with it . Also there are many free downloads available. just go to fms downloads....." "5" "Edgar .S" "June 7, 2009" "Ive seen many great vids on this ,as well as written reviews. I am just about to order this! there has been alot of talk of flight sims an there help, well heres one for ya! you can fly rain or shine, yuo can even fly when theres a hurricane or dust storm, (just as long as the power lines dont fail) Another pro about this flight sim is that you dont have to spend $299 on the same thing, But overall the best part of a sim. is that you dont have to buy spares an fix things up after the worstis over! See ya ,hope that you have fun flying on the sim and whith your real rc aircraft! P.S (post script) I own a hobbicco Skyfly! :) :0" "5" "AAK" "May 18, 2009" "Does anyone know how to download extra landscape or planes to E-Sky? Websites?" "5" "Paul Van Dyke" "April 3, 2009" "For $19.95 this is the bomb! I must say this thing really helped me got better with rc helicopter. Actually i got it for $24.95 and damn i wouldnt even mind to pay $100 because i've burned holes in my wallet by crashing too much! I totally recommended this!" "5" "Dr. W.E. Moore" "March 23, 2009" "I bought it from Xheli, got here on time, perfectly as described and it works. I spent 2 days palying with it, then went to a shop and Flew the Real Flight G4.5. The only real difference is the quality of the graphics. The G4.5 has moderately high end graphics, very good if you need to count blades of grass while you are flying, and like to buy expensive graphics boards, otherwise they do you no good whatsoever. The controls are the same, the basic features are the same. 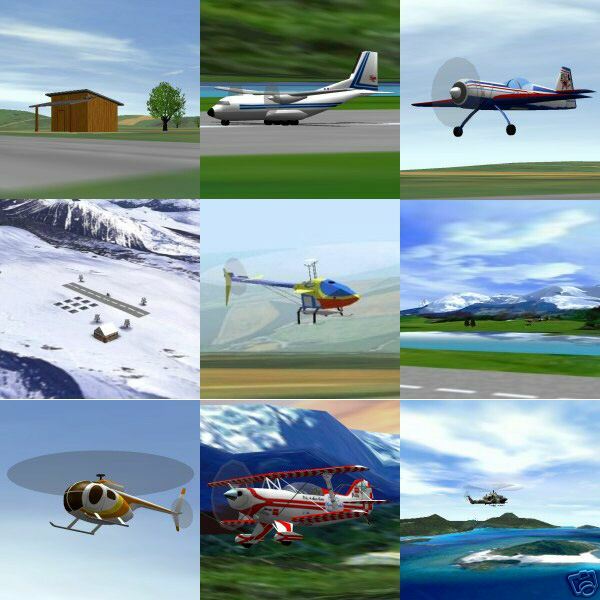 E-Sky lets you download an infintie number of planes and helis, has endless landscapes and teaining fields with obstacle courses. It runs off the USB port power - Just plug and play. It runs on my 2-year old Toshiba laptop as well as it runs on my highend game machine..TOTALLY AWESOME for $20.00. Why spend 10X that much?" "5" "dan w" "February 27, 2009" "sweet!!!!!!!!!!!!!!!!!!!!!!!!!!!!!!!!!!!!!!!!!!!!!!!!!!!!! and sick to own" "5" "wow" "January 23, 2009" "its really cool.Its like your flying it for real and I made it heavier so it feels cool.And you can use it for any rc simulator game!" "5" "Fun Wizard" "December 31, 2008" "This is not only fun, but it teaches you how to use 4ch and up planes and helicopters." "5" "jordan" "October 16, 2008" "must have item if you are learning to fly with 4 ch helicopter and up enough said"
Hot Deal E-Sky 4 CH Flight Simulator Training Kit For Airplanes and Helicopters w/ USB Port EK2-0905A_FlightSimulator55November 15, 2012The installed very easy but sorry to say I was not able to run the program correctly as I'm using windows vista os. The main problem was my video display it would just jump around very fast and was unable to see anything. I do have a xp machine but again my problem is that all the computer are located in the basement of the house I can remote log into the xp computer only problem that the xp computer would not see the usb connection. So i just ended up using the esky transmitter with another program on my main vista computer.